Lace is a delicate but beautiful fabric that is often used for decoration, both on clothing and on other textile products. Lace can be created either by hand or using a machine, and is made from yarn or thread in an open-web like pattern. Originally, lace was made from linen, silk, gold or silver threads, but now it is most commonly made from cotton thread. Patterns are stitched into lace fabric, traditionally creating floral patterns, although crafters now sew all manners of patterns into lace fabric. Lace has been used since the 16th century, and as a result, there are many different varieties of lace, many of which are named after a place. The type of lace is defined by how it is stitched. 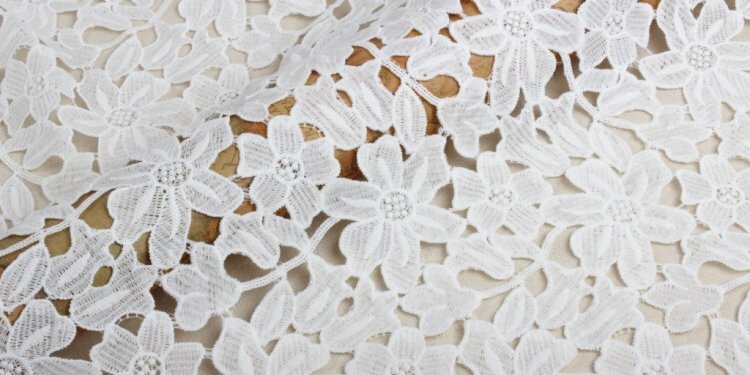 Some traditional laces such as Mechlin, Valenciennes, Honiton, Brussels, Duchesse, Maltese, Chantilly and Point d’Espagne are well known as types of lace, and all have different methods of creation. Here at WhiteTree Fabrics, we have a very broad selection of lace fabrics in many different styles and colours, with the number of lace products we have in stock numbering over 700. Our lace styles include Printed Lace, Floral Lace, Rigid Lace, Stretch Lace, Corded Lace, Crochet Lace, Foiled Lace, Bridal Lace, Guipure Lace, Geometric Lace, Embroidered Lace, Vintage Lace, and Metallic Lace. We aim to offer you the largest variety so that you can find the lace that you are looking for, for your own sewing projects. View our extensive fabric collection and choose from over 1600 designs, in varying patterns and colours. If there's something you're looking for that you can't seem to find, then please . Chances are we can get it and we would much rather stock the lovely things that you want to buy so that our shop offers the best selection possible. If you would like a sample of any of our fabrics, simply click on a fabric on our website and click “Add Sample to Cart”. You can order up to 10 free samples.